Better Get One Of These Now Before They Sell for 10 Grand On Ebay | OhGizmo! This might not be a big seller for Christmas, but it is possible that this could be the next furby or tickle-me-elmo. But then again it could just be something neat that only does modest sales. The toy is Kota the Triceratops robot. 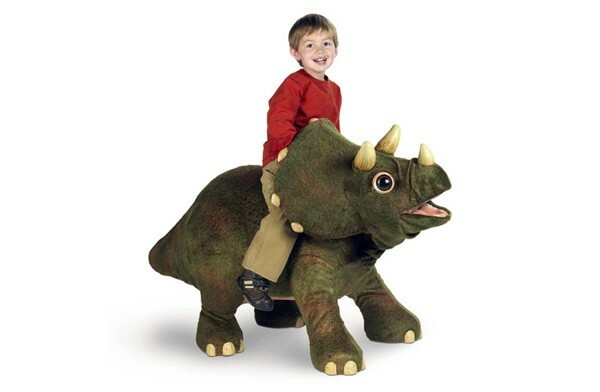 It’s large enough for a young kid to sit on and has 11 different movements and reacts to touch and sound. It isn’t mobile and that may or may not be a good thing if you think of the balancing skills of some toddlers. It will wag its tail and even play some adventure music if it’s in the mood. But don’t take my word for it, check out the video of Kota in action after the jump. If you could ride him however, I would, at this moment, no longer be here. I would me madly trying to find one for my nephew. It's awesome! I would definitely gift it to my niece on her birthday next month! thanks for the information, I liked it a lot. Kota looks like it could become a total hit again this christmas. I think more kids are gettting into the whole collecting toys thing.